RUGGED WIRELESS SPEAKER FOR TOUGH INDIVIDUALS - If everything outdoors is your kinda thing, get ready to fall in love with the FX100 - our newest, most rugged Bluetooth speaker! Enjoy hiking, fishing, beach party or a crazy dance with your toddler in a whole new way. 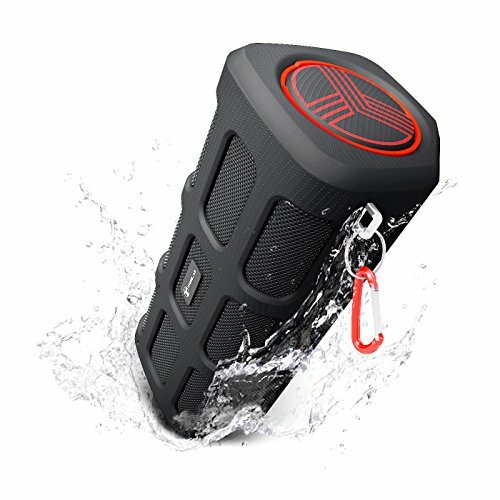 Your new speaker is tough as nails and certified shock-proof, dust-proof and IPX4 waterproof - party freely and don't worry about accidental drops, splashes..or your kids breaking it! IMPACTFUL LOUD STEREO SOUND - External noisy conditions are no match for our newly-developed, loudest outdoor speakers. Just turn the volume up, relax and absorb true 360° surround sound, thumping bass and crystal clear highs out in the open or indoors. We've completely eliminated distortion at high volumes for your maximum listening satisfaction. BUILT-IN POWERBANK - Don't get stuck with a dead device at the wrong time. Our portable speaker comes with 7000mAh heavy duty rechargeable battery to easily recharge all your mobile devices. MAKES MUSIC LAST - No one likes a dead battery! FX100 PLAYS FOR UP TO 35 HOURS - Just imagine the amount of fun you'll have at a picnic or on your boat - on a single charge! LOUDEST SPEAKERPHONE - Simply click to take/end calls and use the built-in noise-cancelling Mic to talk to your loved ones. EASE OF USE & ADVANCED FEATURES - Seamless connection to all Bluetooth devices; iOs & Android smartphones, computer, PC, Mac, laptop, tablet, TV, iPhone, MP3 player. Ergonomic buttons for volume and track control, low battery indicator lights and many more! 100% SATISFACTION GUARANTEE - Make everything you do more fun with FX100 Bluetooth speakers or we'll refund you! 1-YEAR WARRANTY & 30-DAY RETURNS makes this a zero-risk purchase. Also, enjoy our world-famous A++ Customer Care. If you have any questions about this product by Treblab, contact us by completing and submitting the form below. If you are looking for a specif part number, please include it with your message.